For the health of all our guests, proof of current vaccination is required. If your pet has not been vaccinated, please schedule an appointment 2 weeks before boarding to have an examination and begin the vaccination series. This will allow enough time for the initial vaccinations to become effective before boarding begins. Climate control for comfort and health. Dogwalking twice daily, and more often if needed or requested. Clean litter boxes - changed in the morning and evening. Medications, special diets, and other special needs are carefully accommodated. We provide soft bedding for all our 4 legged friends, including special orthopedic padding for our seniors to keep all pets as comfortable as possible. We welcome favorite toys (labeled please!) brought from home. 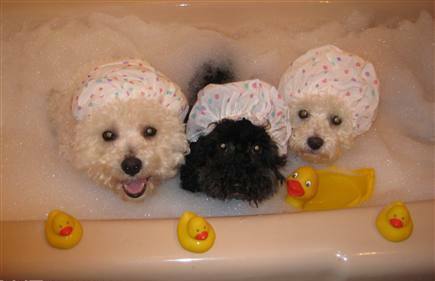 Complimentary bath for dogs lodging a minimum of 3 days. Plenty of fresh water is available at all times. In our facilities, your pet will be cared for by trained staff and veterinary professionals, so you can rest easy while you are away. If you are planning to board your pet over a holiday, be sure to book early, because traditional vacation days like the Fourth of July, Thanksgiving and Christmas sometimes book up weeks in advance.